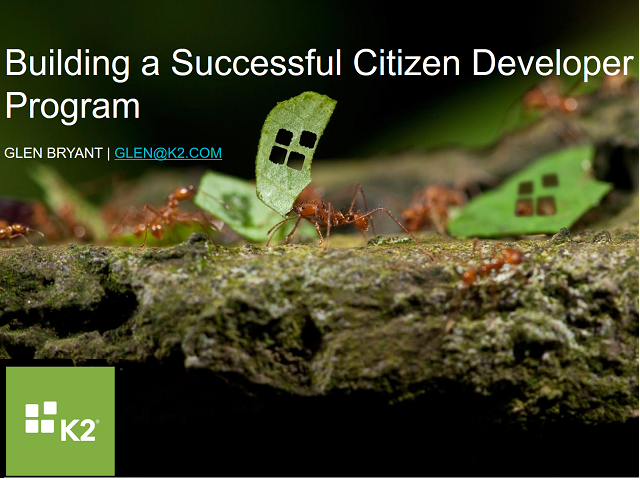 Glen Bryant will dive into what it takes to build a successful citizen developer program - covering approach, implementation, and tooling. Glen is VP of Global Account Management at K2. Listen to 2 Sisters Food Group disclose how they delivered cost savings of more than £250K p.a. and quality improvements of 40% in just a matter of months. See a live demonstration of K2 and Blue Prism working together to demonstrate how you can deliver intelligence automation in Financial Services with RPA and BPA. Andrew Murphy, VP of EMEA at K2, provides practical insights on how to approach intelligent automation - resources, timing and tooling - to jumpstart your road to digital automation. It is clear that major organizations are starting to integrate RPA solutions into their IT ecosystems and those that haven’t are seriously considering the option, as the number of RPA users is doubling every 6 months. In this rapidly developing climate, which platform will help your organization meet their digital transformation goals? Join Andrew Murphy in this webinar, where he will review the core competencies of modern BPM and RPA. Considering whether you should be using neither or both. With low-code and no-code app development, IT departments can now offload some of that work onto the business. However, these platforms don’t offer a solution for the complex, integrated processes that are essential to running an organization that has challenges beyond what’s industry standard. - Achieve low-code scalability and the power of BPM. - Solve both simple and complex business problems with one platform. Learn how to use K2's intuitive, drag-and-drop designers, you can turn a simple document library or list into an app by rapidly designing forms that combine SharePoint and your line-of-business data. Add workflows that involve the right users and automate tasks across systems, regardless of whether they’re on premises or in the cloud. Watch the on-demand part two of our series on Transforming Your Business Processes and learn how to build business applications involving many of the fundamental components including access to data, standardized business logic that aligns with the way an organization executes, and the ability to give users the experience they need on the devices they use. K2 allows organizations to rapidly compose business applications from reusable forms, workflow, and data components using drag-and-drop tooling. Customizing SAP can be complex, expensive and time consuming, which can severely impact business agility. Watch this on-demand webinar to learn how K2 can help you tap the full value of your SAP information, break down technology silos, and increase business agility by delivering apps that make the most out of SAP and your surrounding systems. Learn how to transform your processes with built-in mobile capabilities. In this webinar, you'll see how you can enable your business users to make business happen anywhere with the help of mobile apps. Learn why rapid, reusable development, data management, offline capabilities, project administration tools, end-to-end security and more are crucial to your mobile app strategy. Watch this on-demand webinar and learn how to build forms that work with line-of-business information from disparate cloud and on-premises systems, and support standard electronic form features such as validation, cascading dropdowns and many more. Versatility and customization powers these resource-rich forms, incorporating and implementing personal business applications, accessible from any browser, table or mobile device. With IT teams under increased pressure from around the organisation, how do you keep up with digital transformation and ensure that it gains you a competitive edge? Join us to explore how democratising Digital Transformation in 2018, through process automation, will revolutionise your business. In this Webinar Moises Tavira will explore, and show, how using a modern low code process automation platform will enable you to achieve this. With the empowerment of an all-hands approach – across all areas of the business – with integration of IoT, Legacy Systems and AI, you will see rapid operational improvements, insights and efficiencies. Automate every process with one platform. With intuitive and powerful tools, businesses can rapidly deliver mission-critical applications as well as fast-changing, lightweight departmental processes, all with a single platform. Over 30% of the Fortune 500 and more than 4,000 customers around the world are automating their businesses using the K2 platform. Companies such as Kimberly-Clark and Shell have automated hundreds of processes, resulting in a reduction of development costs by approximately 78%, significantly improving time-to-value, and increasing business process efficiency.